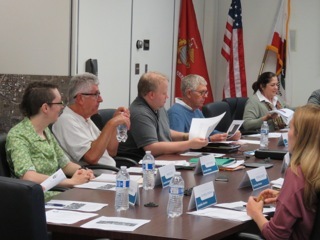 The Costa Mesa Bikeway and Walkability Committee, re-configured following the last election, met for the second time last night and tackled a full agenda. All the members attended except one. The three liaison members - Mayor Katrina Foley, Dr. Kirk Bauermeister and Brent Stoll - were also absent. The committee met in the cozy confines of Conference Room 1A at City Hall, a new venue for them and one that might prove to be problematic if everyone shows up for future meetings. New Chairman, Jim Erickson - a hold-over from the previous group - took charge of the group with skill and time-awareness, keeping things moving throughout the evening. Cynthia McDonald continues as Vice Chair and former Chairman Ralph Taboada remains in the group, so the continuity of the process is retained. The audience attendance continues to be small - a maximum of six people showed up, with only a couple of us remaining through the full two-hour meeting. During Public Comments Marc Perkins provided a handout to the committee to add emphasis to his request for better integration of Orange Coast College into any future bikeway plans. His contention was that the large concentration of bicycle riders at the college does, and will, have a significant impact on traffic and public safety as the campus continues to grow. He cited the on-campus housing planned to provide for an increase in foreign students, whom, he postulated, would be mostly bicycle riders. 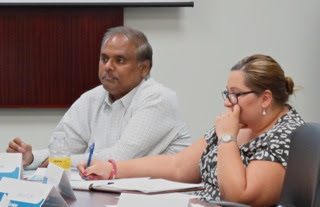 Director of Public Services, Raja Sethuraman, guided a discussion of the Active Transportation Program projects that are part of the budget. A budget study session apparently will be held next Tuesday evening, also in Conference Room 1A, and members were encouraged to attend to observe that process. 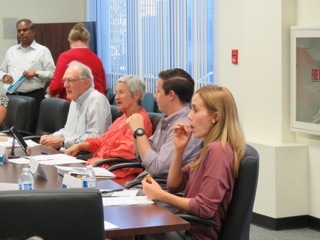 Committee members were asked to provide input on their perception of the need for bike racks around the city, so the discussion went around the room with most members providing specific locations for the needs at both public and private locations. There was the presumption that every public park in the city needs a full compliment of bike racks. Emphasis was placed on the situation at Wilson Park, a venue that is under siege from homeless individuals. Other areas of focus included the business corridors of 17th and 19th Streets. 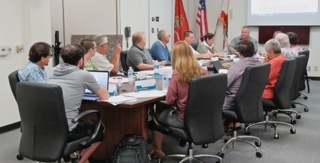 The City has budgeted $50,000 for bike racks around town, so the staff will take the input provided and come back to the next meeting with a list which the committee will prioritize so the installation of new bike racks can commence - most likely being done by City maintenance workers with oversight from senior staffers as to placement. There was a discussion of the Bicycle Master Plan Project, HERE, and the new members were encouraged to go online to familiarize themselves with the document. A discussion of possible sub-committees to focus on specific ideas/areas. During Committee Member Comments members Rick Huffman and Cynthia McDonald provided a handout describing their own recent drive around town to assess the need for bike racks. 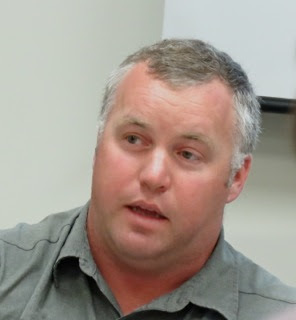 John Merrill described a recent conference he attended at which Santa Ana's installation of "bike pods" - locked bike storage units accessible only via membership - and suggested that kind of infrastructure could be discussed by the group in the future. 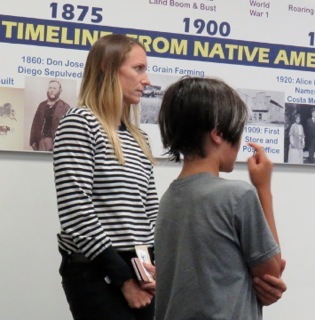 A member of the public, who had arrived late with her son, asked to be heard as a "public comment" regarding a dangerous situation she and her son faces. She apparently lives in the new condo units near Newport Boulevard and Industrial way and her son rides his bicycle to Ensign Middle School, being forced to cross both Industrial Way AND Newport Boulevard to do it. He apparently had an accident where a car knocked him off his bike. He spoke, describing his situation. They asked the committee to pursue some kind of safety measure - a signaled cross walk, for example - to make it safer for folks traveling that route on bikes, or walking for that matter. Member Flo Martin referred the group to the Master Plan of Open Space on the City website, HERE - all 384 pages of it. She referred to several excerpts from that document for their enlightenment. McDonald reminded us that the cutoff date for written comments on that document is next Wednesday, May 10th. Member Bob Graham provided a short presentation on areas of concern - cables that complicate bike riding across the street from Estancia High School and what he described as a growing junk yard at the Costa Mesa Golf Course. He showed slides of each and asked the staff to investigate solutions. 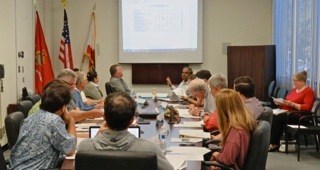 Before Erickson closed the meeting at 8:34 p.m., Sethuraman reminded the group of the upcoming Orange County Marathon on Sunday, which will snarl traffic in several parts of the City, beginning with the far Eastside and including areas in the north and northwest sides before concluding at the Orange County Fair and Event Center. You can read more about it HERE, which also includes links to specific road closures. My impressions of this new group is very positive. The new members bring new energy and I'm encouraged that they will follow in the footsteps of their predecessors and continue to make Costa Mesa a much more bikeable and walkable city. Thanks to them all for volunteering to take on these challenges ahead.